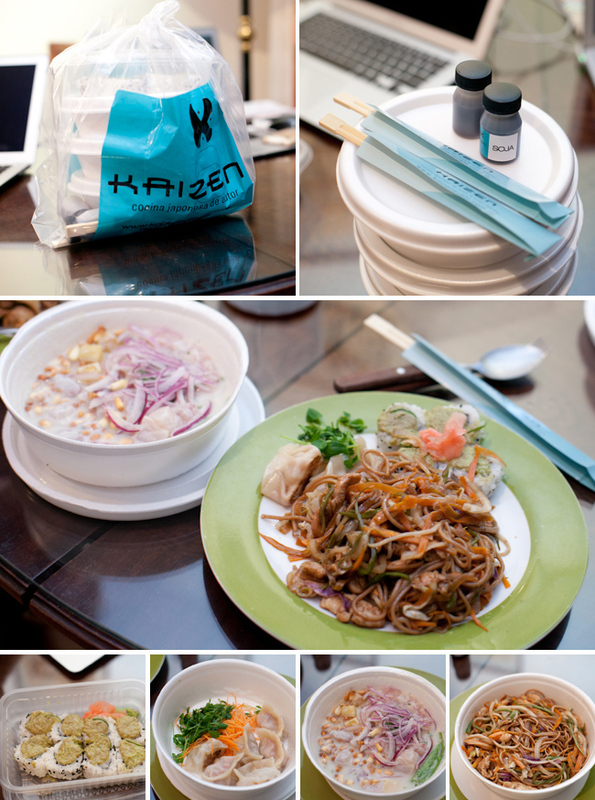 kaizen :: japanese/peruvian | .liveit.loveit.blogit. Last Saturday we spent the day in Tigre, which was amazing. I shot b&w film in Tigre, so you are going to have to wait for the images, but once they’re developed I will certainly share more! By the time we got back to our apartment late Saturday evening, we were worn out. Shells of humans. And going for groceries or out to a restaurant held little appeal to either of us. Enter Buenos Aires Delivery. I’ve already told you all about how awesome Buenos Aires Delivery is, and I think that every city with an independent restaurant scene needs a similar site. On Saturday night, I was feeling like ceviche while the hubs was feeling like pasta, so we met somewhat in the middle (ok, a little closer to my end of the spectrum) and landed on Kaizen – a Japanese/Peruvian place, for ceviche and yakisoba. We ended up ordering four dishes: steamed gyoza, Mex (salmon and guacamole) rolls, chicken yakisoba, and ceviche. We polished it all off and were just a teensy bit hungry at the end of the meal. This is more likely due to the little lunch that we had, rather than the amount of dinner that we had. Appetizers: The gyoza was not so good. It was very doughy, and the outside to inside ratio left something to be desired. I’d give it a miss next time. I actually quite liked the mex rolls, but that could be because of the generous amount of wasabi that was provided to us. Delicious, delicious spice! We inhaled the rolls. Seriously, inhaled them. Yakisoba: Like most things in Argentina, the yakisoba was too salty. That being said, it was quite flavourful and they were generous with the chicken, which itself was moist and delicious. I would probably order it again. White fish ceviche: This was where Kaizen really excelled. I thought the ceviche was excellent – it was not fishy at all, just limey-cilantroy goodness. They were a little skimpy on the sweet potato, but did top it with cancha, which gave it bonus points. Kaizen Sushi, Guatemala 4665, Palermo Soho, Buenos Aires, Mon to Sat, 20-24. You can also order online via Buenos Aires Delivery, minimum 60 peso order. For 150 pesos ($35) including tip, this was a steal of a deal, and I would certainly order in (or visit the restaurant) again.